SPJ DePaul’s executive board at the SPJ-RTDNA Excellence in Journalism conference. From left: Monica Kucera, Monica Carter, Ali Trumbull, Ryann Rumbaugh and Brianna Kelly. 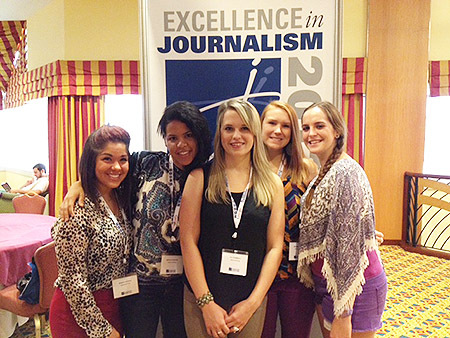 SPJ DePaul’s executive board attended the SPJ-RTDNA Excellence in Journalism conference Sept. 20-22 in Ft. Lauderdale, Fla. The students attended seminars on reporting, writing, broadcast, freedom of information, ethics and social media. Besides attending the sessions, the students also interviewed several journalists and experts on the Freedom of Information Act and how journalists can overcome roadblocks for public records requests. They’re creating two videos about FOIA and will publish them on YouTube in October. Nearly 1,000 professional journalists attended the conference. This is the third consecutive year that SPJ DePaul has attended.